Interfilk is registered charity that creates and manages a fund for the filk community. Funds are raised primarily but not exclusively by auctions and used to fund travel, convention costs, and accommodations. Using these funds, eligible members of the filk community are sent to conventions where their work is not widely known, usually in a different geographic region. The main goal of Interfilk is the promotion of cultural exchange through filk music. We provide the means and opportunity for the selected members of the filk community to participate in a filk convention they otherwise would not be able to attend. This provides the opportunity not only to share performances and songwriting, but to also share techniques for publishing, recording, convention organization and other essential talents with a community outside their immediate location. A secondary goal is supporting filk conventions by adding talented (though often not widely known) persons to their program. Interfilk tries to select guests who would draw people to see them again at another convention. The Interfilk Directors actively look for Guest candidates through attendance at filk conventions and other fannish events; including other gatherings and activities that bring filkers together (house sings, picnics, etc.). When we have raised sufficient funds to cover the cost of travel and accommodation expenses for a guest, Interfilk contacts filk conventions to see if there is a specific type of guest they’d like in any particular year. This might be to meet a theme, balance styles with other guests of the convention, etc. Once a guest and convention have been identified, Interfilk invites the guest, works with the guest to make travel arrangements, and serves as the initial liaison between the guest and the convention. The guest attends the convention and participates, socializes, shares their talents and helps other people display theirs. They may also choose to represent something specific about their home region that is otherwise unknown to their host convention. On their return home, the guest shares their experiences of the convention. Through auctions of items donated by the filk community, featuring our talented Interfilk runners. 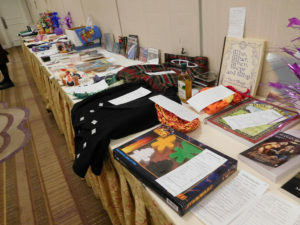 Auctions are held at the North American filk conventions and sometimes at the World Science Fiction Convention. Through donation of royalties from recordings or publications by performers and songwriters. Other fund-raising activities, organized by various members of the filk community. Please note that in excess of 95% of the funds raised are used for the travel (transportation, accommodation and some incidentals) of guests. A small amount is used for the organization, primarily for administrative expenses (legal, accounting, etc. ), like telephone conference calls or other meetings of the directors. Interfilk is a California charitable organization registered under section 501(c)(3) of the United States tax code. Donations are tax-deductible, items bought at auction may be partially tax-deductible, and many employers sponsor matching gift programs. Canadian registration as a charity or non-profit may occur at some time in the future.